Oh, hello, world. I'm back :) | escaped. Last few days had been extremely tiring on my part. I spent 4 straight days doing seizu, not eating or getting any sleep(ok that's a lie, I still sleep but not more than 5 hours like I used to) and kept staring at this bloody monitor finishing seizu only to find out my greatest piece of the six of them is corrupted and cannot be open. Seriously. My 6 hours of work cannot be open, means I have to do it again, from scratch. Yes, I have to do this TWO times. And it's just one out of 6 pieces that we have to submit. And till now I still don't get the connection between seizu and chemical engineering. 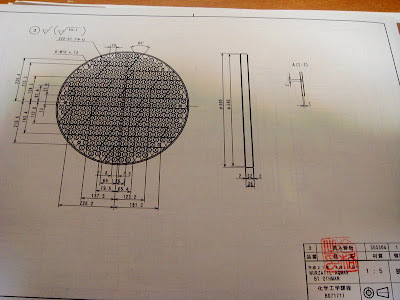 Do you know how bloody hard it is just to draw a half circle? Do you know how hard it is to draw a freaking bolt or screw or whatever the name is?? 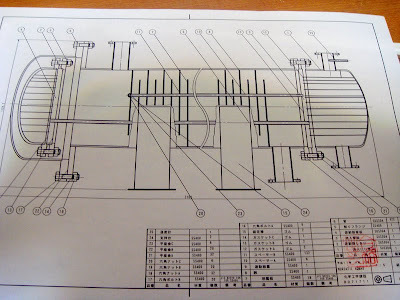 Unless you're a pro at CAD and have mastered it by heart, you'd be like me, spent days just to draw a heat exchanger-whatever-the-name-is. Called Takyubin(a service to send things to places, like Poslaju) to send my cargo bag off to Kansai Airport, managed to clean up the mess in the room since I've been too busy doing seizu, went out to pay bills, grocery shopping, etc. Oh. And about this whole long distance relationship thing, I think I'm doing ok, surprisingly. (He must be rolling on the floor laughing right now) Ok, it's not like I haven't had any breakdown or anything like that but I thought it would be worst than now. But it's not. And I'm grateful for that. I have a renewed respect for long distance relationship couples. Another one of them, just for your viewing pleasure. thank you streamyx,tanpamu idup ku tak bahagia. i want to go back to japan,badly!! sedey.